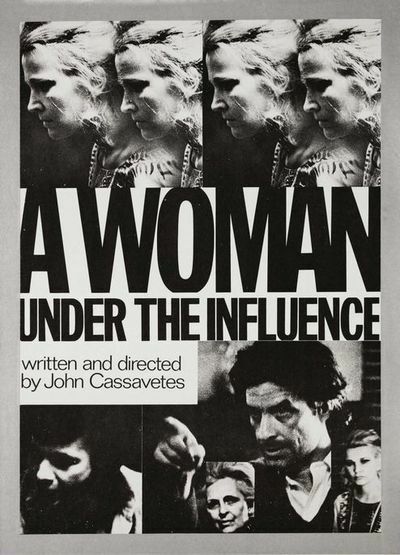 John Cassavetes’ “A Woman Under the Influence” gives us a woman whose influences only gradually reveal themselves. And as they do, they give us insights not only into one specific, brilliantly created, woman but into some of the problems of surviving in a society where very few people are fully liberated. The woman is Mabel Longhetti, wife and mother and (in some very small, shy and faraway corner) herself. Her husband, Nick, is the head of a construction gang and a gregarious type with an expansive nature; he’s likely to bring his whole crew home at 7 a.m. for a spaghetti dinner. Mabel isn’t gregarious, but, she tries. She tries too hard, and that’s her problem. She desperately wants to please her husband, and when they’re alone, she does. They get along, and they do love one another. But when people are around, she gets a little wacky. The mannerisms, the strange personal little ways she has of expressing herself, get out of scale. She’s not sure how to act, because she’s not sure who she is. “I’ll be whatever you want me to be,” she tells Nick, and he tells her to be herself. But who is that? The film takes place before and after six months she spends in a mental institution. Her husband has her committed, reluctantly, after she begins to crack up. There have been some indications that she’s in trouble. She behaves strangely when some neighbor children are brought over to stay for a while with her own, and the neighbor is afraid to leave his kids because of the way she’s acting. But what, exactly, is “strange”? Well she’s insecure, hyper, manic. She laughs too much and pushes too hard. She’s not good with other people around. So her husband does what he thinks he has to do and commits her. But what about him? What kind of a guy is he? It’s here that “A Woman Under the Influence” gets to be terribly complicated, involved and fascinating -- a revelation. Because if Mabel is disturbed, then so is he. He’s as crazy as she is, maybe more so. But because he’s a man and has channels for his craziness, he stays at home and she gets sent away. Their ways with kids, for example, are revealing. She feels insecure around them. She’s not confident enough to be a mother, and almost wants to be another kid. But the father, when he takes over the responsibility of raising them, yanks them out of school in the middle of the day and drags them, bewildered, to the seashore for the most depressing, compulsory day at the beach we can imagine. And then on the way home he lets them share a six-pack with him. If Mabel wants to be one of the kids, Nick wants them to be three of the boys. I don’t suppose (although I’m not sure) that real families like this exist, and I don’t think Cassavetes wants us to take the film as a literal record. The characters are larger than life (although not less convincing because of that), and their loves and rages, their fights and moments of tenderness, exist at exhausting levels of emotion. Nick, as played by Peter Falk, shouts and storms and is always on. Mabel (Gena Rowlands, who won an Oscar nomination) seems so touchingly vulnerable to every kind of influence around her that we don’t want to tap her because she might fall apart. Because their personalities are so open, so visible, we see what might be hidden in a quieter, tidier film: that Nick no less than Mabel is trapped in a society where people are assigned roles, duties and even personalities that may have little to do with what they really think and who they really are. This is where Cassavetes is strongest as a writer and filmmaker: at creating specific characters and then sticking with them through long, painful, uncompromising scenes until we know them well enough to read them, to predict what they’ll do next and even to begin to understand why. Mabel and Nick and their relatives and friends are fully realized, convincing, fictional creations, even though Cassavetes does sometimes deliberately push them into extreme situations. There’s a scene for example where Nick goes almost berserk in throwing a party for Mabel, who’s due home from the institution, then tells all the non-family guests to leave immediately and then berates the family, and Mabel, and himself, in a painful confrontation around the dining room table. The scene’s just too extreme to take literally. But as psychodrama, or whatever you want to call it, it abandons any niceties or evasions and deals directly with what the characters are really thinking. Berlin 2018: Tower. A Bright Day.